The "Project statistics" window shows you the overall totals for the entire project. The "Project statistics" window can be accessed via the "Project \ Statistics..." menu item in the main window. The details of the project itself. The currently worked-on activity (if any). 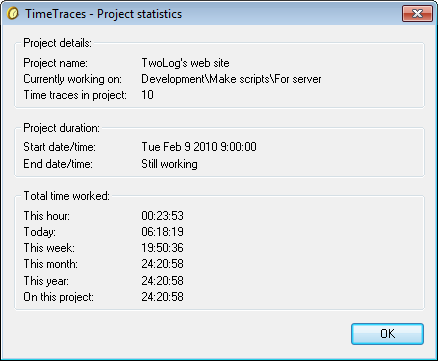 Label "Time traces in project"
The number of registered time traces in the entire project. The first registered (start) date/time and the last registered (end) date/time in the project. The total amount of time worked on this project within the given time periods. Show the "Project statistics" window help page.